Bill Ward on vocals for It's Alright? Aimless, gutless tracks that meander with all the purpose of an autumn leaf swirling in the wind? Nothing but cow bells and lyrics that are simply inane on Rock 'N' Roll Doctor? The band plagiarizing itself when the Dirty Women riff finally kicks in, and it's heart is stolen from N.I.B.? The original line-up of Black Sabbath hits the bottom of the barrel with a sickening thud. The once proud leaders of metal innovation are reduced to a ridiculous album almost devoid of any original ideas. 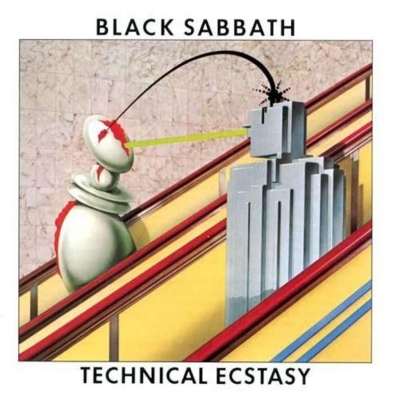 Technical Ecstasy is instantly forgettable, as the band searches with increasing desperation both for any spark of inspiration and for any reason to stay together. Back Street Kids, You Won't Change Me and the soulful ballad She's Gone show a pulse, but it's all a far cry from what the band was once capable of. The other five tracks alternate between bland and embarrassing. Osbourne left the band soon after the album was released. He briefly rejoined for one last record, Never Say Die!, before the original four members parted ways for good. They were still together in name for Technical Ecstasy, but they had mentally and emotionally long since checked out. Engineered by Robin Black. Mixed by Tony Iommi and Robin Black. Mastered by Tony Iommi and Bob Hata.